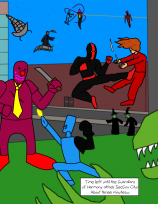 With the power to create an unbreakable sphere of pure force around himself, Forcefieldo is a member of the Strange Squad, the world’s foremost superhuman explorers. When not on missions with the Miami-based superhero team, he returns to his home in Nairobi to fight crime there. Forcefieldo is a pretty generic superhero. That is kind of the point, though. 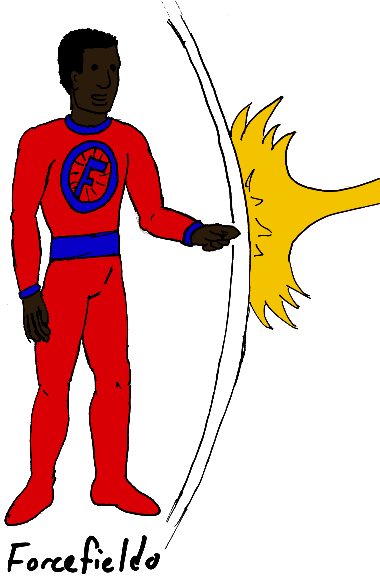 Forcefieldo is a Kenyan, but that is not represented at all in his superhero identity. Far, far too often in comics when a character is from any country other than America, or any ethnicity other than white, they’re some stereotype. There are exceptions obviously, especially as time goes on and more characters are created, but, man, it’s crazy how many not-exceptions there are. So anyway, this is my attempt to add one more to the exception pile. For the record (there’s a record, right? ), Forcefieldo and the Strange Squad are both from my old notes. The Strange Squad in particular was my Fantastic Four rip-off team, though my version progressed from the 60s to the present (well, the 90s, which was the present at the time) and recruited new members as others came and went. Forcefieldo joined the team in the 90s. I’ll probably have more Strange Squad characters show up this year, since reaching into my notes will usually be quicker than thinking up someone new.